Wind and rain were the winners and highlights of this event. To avoid a late start I packed the car on Thursday night and I set off for mount Ginini after work on Friday afternoon. I arrived on site at about 7 pm and put up the tent and the 20m vertical. I had a chat with a few other hams that night and tested out the antenna. A strong contact with a ZL2JBR was particularly encouraging. On the ic703 with 10w output I received very good signal reports. The second hf antenna, a linked dipole, was set up on Saturday morning. 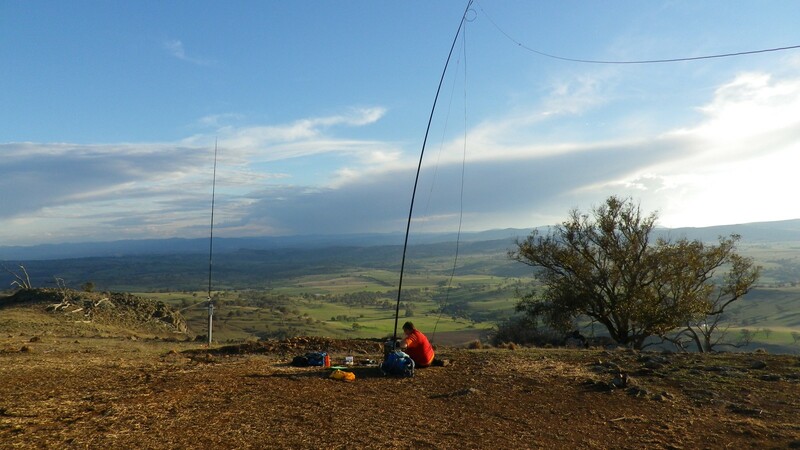 I heard a bleat from SOTAGOAT on the iPhone and found it was my SOTA buddy Andrew vk1nam operating at the south coast about 120-130km away announcing he was calling cq on 28.490. I dropped the dipole and removed the links at the 10m position and walked back to the tent to set the radio on the right frequency. Tuning across the band I found a number of USA stations at good strength. Ok so 10m was in good shape but I had VHF antennas to assemble so I started back out of the tent. Before moving far I had to return to the radio as there was a loud cq call heard from vk1nam on a SOTA peak at the south coast. We had a good contact that surprised us both. I continued the assembly process with a few breaks to make some SOTA contacts on 40m with some of the regular chasers. The VHF and uhf antennas went together normally though I had made it more difficult by assembling them on the downhill side of the slope from the mast position. By the time I was ready to lift the mast up a team of radio club members had arrived Onsite to make adjustments to the repeaters onsite. I asked Matt vk1ma to help with the mast so it was soon up and working. VHF conditions seemed poor. Signals from vk2rsy and vk3rgl beacons were ok on 144.420 and .530 but neither was at a good strength and their 432.4 signals were weak or unreadable. The contest got under way at midday local time but the poor weather had obviously kept a lot of operators at home. Progress on VHF was very slow. 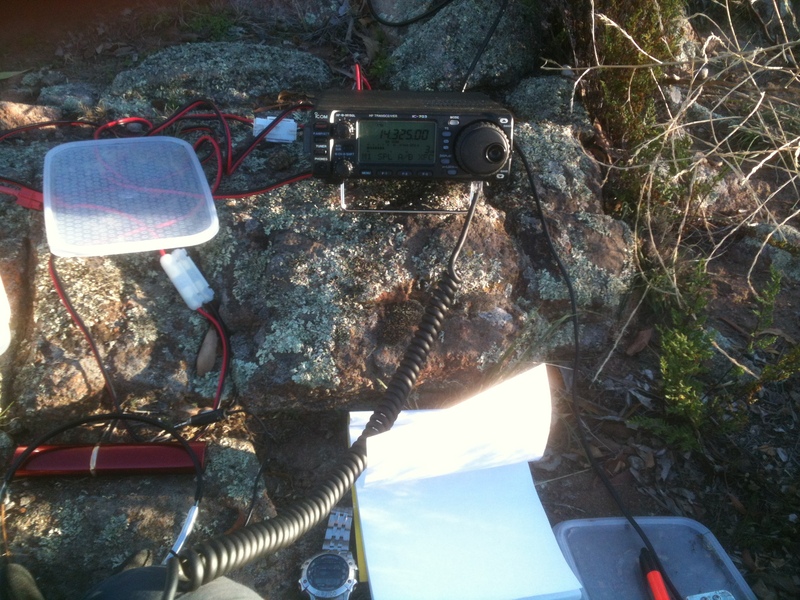 One vk3 portable in the voctorian high country was worked on 50, 144, 432 and 1296 MHz. A few others were heard but not worked. Towards Sydney there were several on air and later on Saturday vk1pwe was worked at Mt Coree about 30km north of my position. Saturday evening approached and the repeater team paid me a visit before leaving for Canberra. They cheerfully told me the forecast was for very cold conditions and possibly snow overnight. A session on 20m cw and Ssb netted about 35 SOTA contacts running the 703 on battery power. The vertical worked well. Later some more contacts were made on the VHF bands but generally it seemed like the VHF scores would be very low. The 20m vertical – what was wrong with it? I built a 20m vertical antenna for sota use. 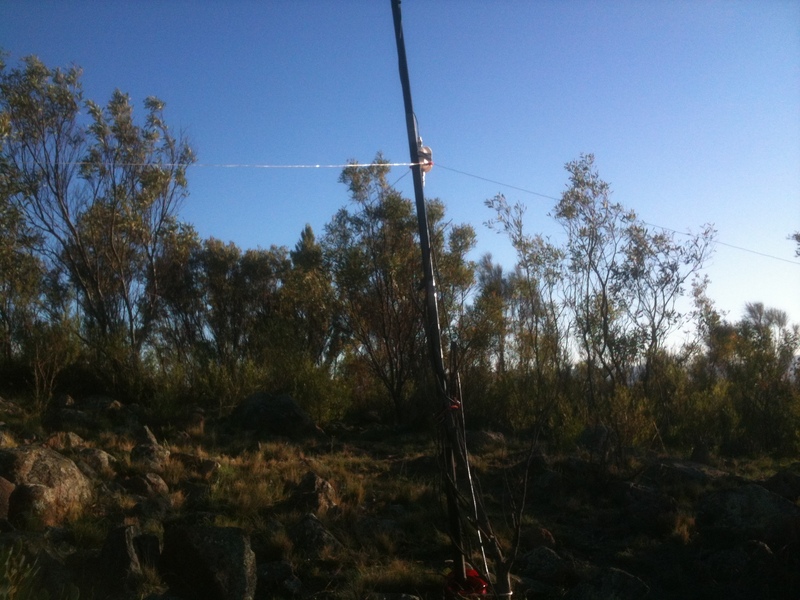 A squid pole supported the vertical section and the radials were elevated about 1.5m above ground. When I first used it, results were not good. On receive, it sounded dead or near to it, with very little of the normal band noise I expect to hear on 20m. On transmit, the impedance was way out, an antennna matchbox being required to make it accept power from a radio designed for a 50 ohm load. Clearly something was wrong with the antenna. It was simple enough. A quarter wavelength of wire attached to the side of a fibreglass squid pole. Three or four radials connected to the outer conductor of the feed line. The connections for the main radiator and the radials were on a plastic box. An SO239 socket was at the base of the box and another at the top for the vertical element. Possible problems were considered. The connections in the box were simple enough. The length of the vertical element was checked. A quarter wavelength on 14.1 MHz, adjusted for a 95% length due to the wire thickness and the insulation calculated at 300/14.1/4*0.95 = 5053 mm. I asked on the yahoo group SOTA_Australia whether anyone else had experienced detuning of wire elements laid along a squid pole, or had noticed losses introduced by a squid pole. Some comments were made by list members about their experiences – mainly good. Warren VK3BYD offered me some segments of the fibreglass from a broken squid pole, and I took up his offer. In a few days I received a Jiffy bag containing three segment of fibreglass tubing, probably the top and thinnest element of a squid pole. At the Canberra Radio Club meeting in October or November I took the fibreglass segments along to do some experiments on the impact of the squid pole material on the losses in an inductor. Dimitris VK1SV brought his antenna analyser and a tuned circuit made from an air cored inductor and a tuning capacitor. Measuring the losses in a tuned circuit comprised of the inductor and a variable capacitor in parallel showed a very low resistance component of less than an ohm. Introducing various materials into the inductor core had various effects. The fibreglass sections from the broken squid pole had almost no effect. A piece of pine wood about 50 x 20mm and 100 mm long had a huge effect, the losses in the wood introducing many ohms of resistance into the circuit. The focus then turned to the connections inside the antenna base, a box containing a few wires and sockets. I then discovered that at least one of the connections to the radial socket was not well soldered. I reconnected and resoldered all the connections between antenna, incoming feedline and the radials. Next time I tried the antenna was at Spring Hill, the site of the original operation. This time performance was much better, with several European contacts made on CW and SSB, using the 10w from the IC703. The frequency of best match was still not 14.1, tests indicated it was resonating lower than 14 MHz. The main element was electrically shortened by folding over about 100mm of the radiator at the top bringing the SWR curve of the antenna to a much more satisfactory level. 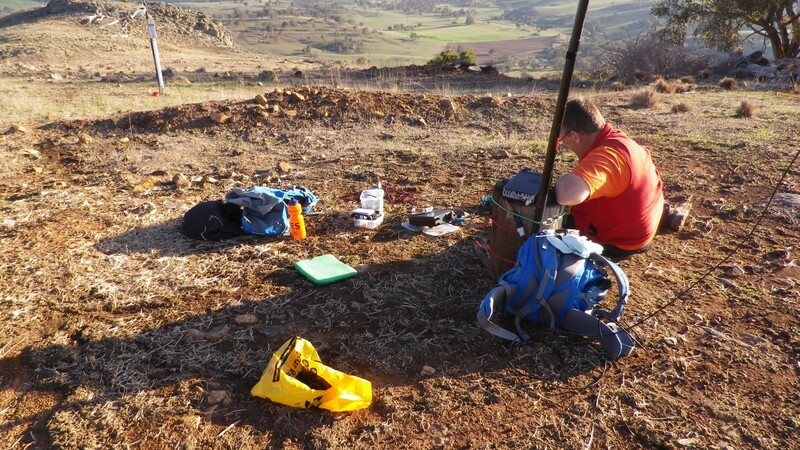 When used at Bowning Hill in a joint activation with Andrew VK1NAM, the antenna performed well, with the ATU not required. We made a number of contacts with European chasers. The IC703 and IC706 have a very handy SWR curve feature allowing you to choose a band segment and measure the SWR at each of 3, 5, 7 or 9 spot frequencies, spaced by 10, 50, 100 or 500 khz, depending on the band and the frequency span you need. Using the 50khz increment centred on 14.250, with 9 spot frequencies allows for a quick check of how the antenna behaves across the band. I used that feature when adjusting the resonant frequency of a helical whip and wrote about it in an earlier post. The outcome is that the antenna is now operating as it should and tests done on Bowning Hill comparing it with the linked dipole indicated that it is equally effective as a dipole at 7m above ground. When the dipole was end-on to the signals from the UK, there was a marked reduction in the signal level received at the EU end of the path. The vertical is simple to erect and has no wind loading additional to the squid pole itself. For this reason I think it is a good option for SOTA operations.